Actress Keerthy Suresh is celebrating her birthday today. She is acting with power star Pawan Kalyan in his new movie directing by Trivikram Srinivas. The movie team released a special poster on the occasion of her birthday. Here is the special poster of Keerthy Suresh from PSPK25 team. Apart from this movie she also signed few movies in Telugu. She is playing a key role in Savitri’s biopic movie Mahanati. Mahanati movie is being directed by Nag Ashwin and produced by Swapna Cinema banner. 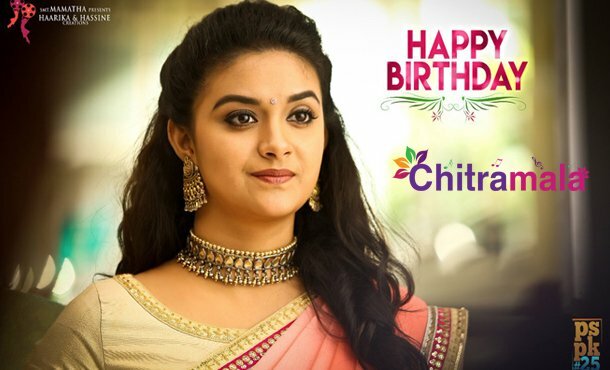 Chitramala wishes a very happy birthday Keerthy Suresh! !